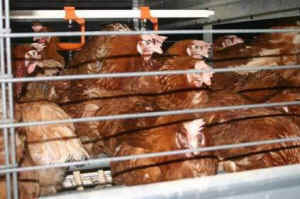 An "enriched" battery cage, according to HSUS and the egg industry. The Humane Farming Association (HFA) and a broad coalition of animal organizations are celebrating a victory as the United Egg Producers (UEP) and the Humane Society of the United States (HSUS) failed to insert Senator Dianne Feinstein’s controversial "Egg Products Inspection Act Amendments" (S. 820) into the Farm Bill. Referred to by many as the Rotten Egg Bill, Feinstein’s measure faced the vehement objections of animal advocates and others nationwide. Feinstein’s Egg Bill (S. 820) would codify a controversial deal between the UEP and a co-opted HSUS, which is now endorsing the same egg factory cages it had long opposed. "We are relieved that the best interests of farm animals and the American public were placed above the cynical political interests of HSUS and the egg industry," said Bradley Miller, National Director of the Humane Farming Association (HFA). "Unrepentant, UEP and HSUS are now threatening to push their Rotten Egg Bill through ’different legislative avenues.’ We will continue working to insure that those other avenues are also dead-ends." UEP and HSUS claimed "states’ rights" as their reason for opposing (separate) legislation introduced by Congressman Steve King (the "King Amendment"). But they argue against states’ rights – and for the federal preemption of state anti-cruelty laws – when it comes to promoting the Egg Bill. "As bad as it was, the King Amendment to the Farm Bill would not have preempted California’s Proposition 2. Only the Egg Bill (S. 820) would do that," noted Miller. "HSUS and UEP cynically embraced state’s rights while objecting to the King Amendment. At the very same time, they seek to establish cages as a federal standard that would nullify Prop 2 and all other relevant state laws across the nation. The hypocrisy is simply astounding." UEP and several of the egg companies it represents have been sued repeatedly for alleged illegal price fixing, paying $25 million to settle allegations that they illegally manipulated the price and supply of eggs under the guise of instituting standards for animal welfare. Now, they are asking Congress to codify a set of standards that would, in effect, provide legal cover for the very activities of which they stand accused. As for HSUS, it is now using funds to defend itself in a major Racketeer Influenced and Corrupt Organizations Act (RICO) lawsuit. At risk are literally millions of dollars in charitable donations. "Fortunately, Congress has thus far refused to jump in the middle of a price-fixing scandal just to placate an egg industry trade group and a discredited HSUS," said Miller. In addition to the Humane Farming Association, opponents of S. 820 include: Friends of Animals, United Poultry Concerns, PETA, Last Chance for Animals, In Defense of Animals, Action for Animals, Green Vegans, Northwest Animal Rights Network, Defend Animals Coalition, Political Animals, Animal Protection League of New Jersey, Maple Farm Sanctuary, Georgia Animal Rights and Protection, Canadians for the Ethical Treatment of Food Animals, Action Volunteers for Animals, Vegan Society of Peace, Humane Farming Action Fund, Sunnyskies Bird and Animal Sanctuary, SAFE, Animals Unlimited, Massachusetts Animal Rights Coalition, Purpose Group International, Chicken Run Rescue, Pasado Safe Haven, Associated Humane Societies – as well as the vast majority of rank and file animal activists.